Subscribe to the monthly Partner-to-Partner (P2P) newsletter to receive valuable partner updates and the latest news on Basware products and technology innovations. 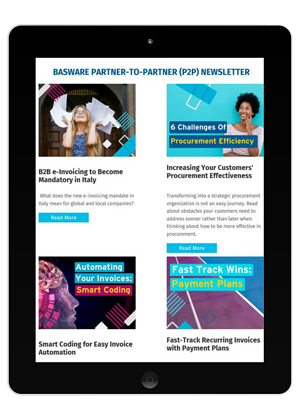 Basware Partner-to-Partner (P2P) monthly newsletter contains everything you need to know to help future-proof your business and unlock savings for your customers. Get partner updates, exciting product releases and P2P innovations while knowing what events and networking opportunities are on the horizon.